Networking. A word, the word, heard every day in the job world. At a time when employment rates soar, the worst position to be in is ours—recent college graduates or those headed that way. If our parents are being let go from jobs they’ve held for over thirty years, how are we expected to land our dream jobs? Or any minimum-wage, ‘pay the bills and get by’ type of job, for that matter? Networking. It’s about the only key to success at this point. We’re told to get good grades, volunteer our time, and give back to the community. We’ve been told this throughout high school and now the same is being reiterated throughout college. These are all seemingly important; but if everyone does this, then the only way one would stand apart from another is by who he or she knows and how they can help them get to that next level. Now don’t fret—if someone in a high profile job doesn’t come to mind immediately, it doesn’t mean you are all out of luck, because just two weeks ago, that person was me. 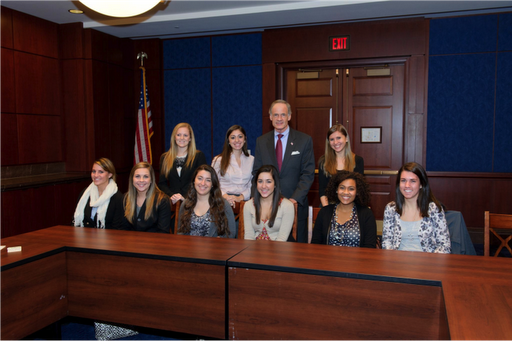 I traveled to Washington, D.C. a few weeks ago with fellow girls from our Chapter to visit Ketchum PR, tour the Capitol, and meet with Senator Tom Carper and his Public Relations staff. As always, after meeting professionals, we were handed business cards of almost all and were told to “Keep in touch”. Because I am interested in the governmental aspect of PR, I decided these professionals would be especially important to follow up with. I sent out e-mails to all those we had met that day. I expressed my gratitude for taking time out of their days to meet with our group, and for all the advice they had shared. I also asked them to keep in touch in the future for any potential job opportunities. Five minutes is all it took. Not expecting a response out of any of these professionals, I simply felt good about sending a quick thank you note their way. Within two days, I had received responses from all three women. All saying thank you for the follow-up message, thank you for visiting us, and most of all, thank you for keeping us in mind when considering future employment opportunities. Perhaps the best e-mail was my third, however. Emily, Carper’s Communications Director, asked me what I specifically meant by “future opportunities”—how soon is the future, she asked. I told her about UD’s winter session and that I would be back at home in Virginia for those six weeks. She offered me the opportunity to intern in their DC offices as a Public Relations intern. I didn’t know anyone working on Capitol Hill. I had no crazy, cool connection that would get me to the top fast. I simply sent out an email and asked for an opportunity. That opportunity was granted and for that, I am unbelievably thrilled as well as gracious to PRSSA for making it a possibility. Networking is what got me to my dream internship, and it can do the same for you. An internship, job, career—they’re all out there; so what are you waiting for?